Trainer Maria Borell is suing Gallery Racing Stables, LLC, and owners James and Linda McIngvale for breach of contract and defamation. 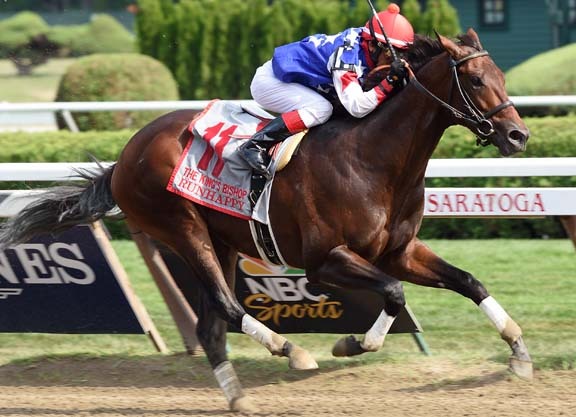 In a lawsuit filed Tuesday morning in Fayette County Circuit Court in Kentucky, Borell is seeking “at least” $122,752, plus two lifetime breeding rights to GI Breeders’ Cup Sprint winner Runhappy (Super Saver), who won five consecutive races after Borell was hired as the colt’s trainer. According to the complaint, Breeders’ Cup Ltd. and Keeneland Association are named as third-party defendants because they are believed to be holding some of the funds to which Borell claims she is entitled. The case will go before a judge at 1:00 p.m. Friday to determine whether the purse money allegedly held by Keeneland and the Breeders’ Cup should be placed in escrow until the case is settled, said Richard A. Getty, the attorney representing Borell. “We’re fine with only sequestering the amount that she claims is due to her, even though we have defamation claims that probably result potentially in far more damages,” Getty said. The lawsuit is the latest salvo in a whirlwind week-and-a-half since Runhappy’s track-record victory in the BC Sprint. First Borell was fired 24 hours after winning the BC Sprint when she clashed with Laura Wohlers, who is the racing manager for Gallery and the twin sister of Linda McIngvale. The argument centered on whether or not Runhappy had heat and filling in an ankle, with Borell insisting that the colt remain in his stall. Wohlers disagreed and wanted to send Runhappy to the track to jog. She dismissed Borell and James McIngvale later confirmed the firing. Borell’s dismissal was not out of character for McIngvale. In the 15 years since he first began owning horses, the Texas retail furniture magnate has hired and fired at least 33 different conditioners, including such luminaries as Bob Baffert and the late Bobby Frankel. Two days after her firing, on Nov. 3, Borell alleged that McIngvale never paid her the industry-standard 10% cut of Runhappy’s victories. She hired Getty to draft a demand letter with the hope of avoiding taking the matter to court. Getty said he initiated talks last week with McIngvale’s attorney that went nowhere. He suspects that is because sometime since his last communication with that lawyer, McIngvale has fired him. McIngvale, reached by phone late Tuesday afternoon, did not want to discuss specifics about the case. “We’ll let the courts work it out. The truth always comes out in the end. It is what it is. I’m too old to be surprised [by the threat of lawsuits] anymore. I’ve got lawyers working on it. That’s their job to do all that stuff. I just sell furniture,” McIngvale said. Borell’s civil complaint now states the opposite, that she was entitled to a portion of purses and breeding rights. Beyond Runhappy, the suit also includes a $1,302 “trainer’s share” and a $5,000 commission from another McIngvale horse, Triplehott (City Zip), who won and was claimed for $50,000 at Arlington Park June 27. (Note: A copy of the lawsuit is here. One curiosity is that Equibase lists Borell as the trainer of record from July 7 onward, but the tally of purse money allegedly due to her only includes four of Runhappy’s wins, from July 31 forward. It also acknowledges McIngvale made a partial payment of $10,000 to cover winnings related to the GI King’s Bishop S.). Borell, 32, is a Syracuse, N.Y., native who has lifelong experience with horses, but limited opportunities as a licensed Thoroughbred trainer. Prior to taking over the training of Runhappy in July, she had never won a race from 22 lifetime starts. Borell has declined repeated requests from TDN to speak about the case. When asked Tuesday to clarify what her next move professionally might be, she wrote in a text message “not at this time, sorry.” The verification page of the lawsuit that Borell signed was stamped by a notary public in Marion County, Florida, indicating that she is not currently residing in Kentucky. Borell’s Twitter account began alerting visitors to a social media fundraising campaign Tuesday that has been launched “to help me get back on my feet.” The site www.gofundme.com is soliciting donations to help pay for “lawyers, relocating” costs. As of late Tuesday afternoon, $1,245 of a $10,000 goal has been raised. McIngvale, 64, is the owner of Houston-based Gallery Furniture, which he sometimes promotes in television commercials while wearing a mattress costume as the character “Mattress Mack.” McIngvale had never won a Grade I until this year with Runhappy.